A warm quilt can be a comforting item for those experiencing difficult times, and a group in Estacada has dedicated time to creating numerous handmade blankets for others. The Garfield Skip-a-Week Club donates quilts to the Yellow House in Estacada, Estacada Community Center, Estacada Relay for Life, Estacada Summer Celebration, and numerous other charities and agencies. Club members estimate that they make more than 100 quilts for charity each year. Often, when a community member passes away, their next-of-kin donates fabric to the Skip-a-Week Club. Sometimes the deceased were members of the club. Recently, the group received a donation from the family of local resident Victoria Shively, from which they created 10 quilts for various charities. Once a club member finishes working on a quilt, they select the organization that it goes to. 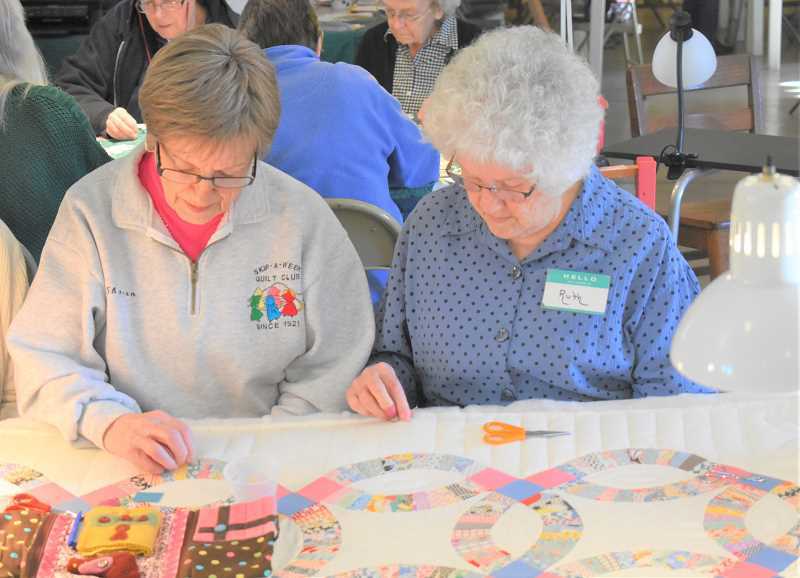 "(The quilts) can help warm someone," said club member Ruth Lazott, adding that she appreciates being able to do something that supports others. Along with donating quilts to other organizations, members of the club can request friendship quilts from the group, and other community members can purchase quilts. The sense of community is strong among attendees of the Skip-a-Week Club. "A lot of us have been together for 20-plus years," said club member Sharon Young. Established in 1921, the club is the longest continuous hand-quilting club in Oregon. Though they met every other week in the past — which gave rise to the organization's name — members now meet from 10 a.m. to 3 p.m. every Wednesday at the Garfield Grange, 33460 S.E. Divers Road. The group also studies the history of quilts through documentation and hosts an annual quilt show every summer.